By Steven T. Zech for Denver Dialogues. 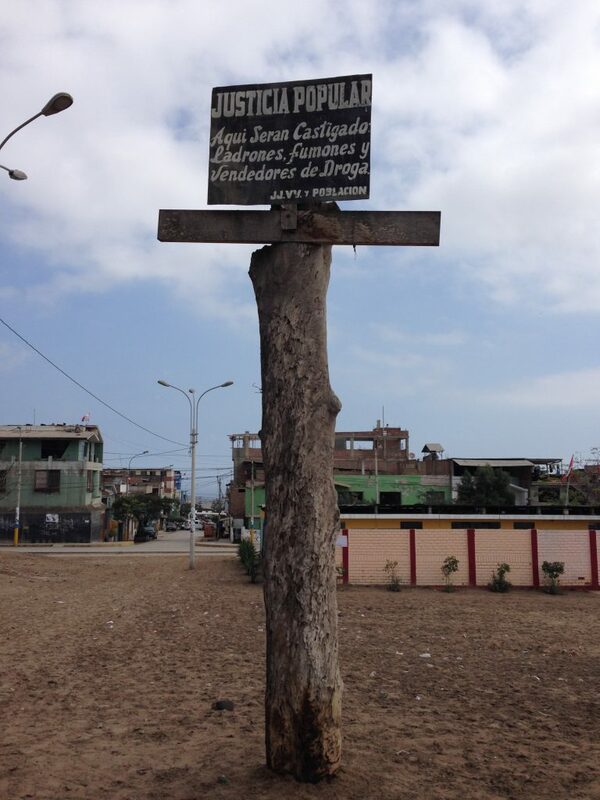 A sign on a cross located in Sector 2, Group 18 of the Villa El Salvador district in Lima warns, “Popular Justice: Thieves, Stoners, and Drug Dealers Will Be Punished Here.” Photo by Steven T. Zech. 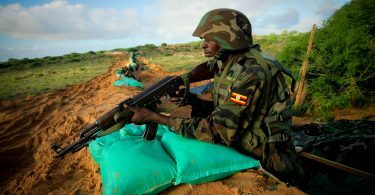 Cases of extrajudicial vigilantism often only serve to exacerbate insecurity and raise levels of violence. This became all too clear when the 2015 Peruvian urban vigilante movement, “chapa tu choro” (catch your thief), went viral on social media and led to an increase in neighborhood patrols and incidents of violent vigilantism. In extreme cases, civilians lynched, beat, and whipped criminals while large crowds looked on. International and Peruvian news outlets reported widely on these types of incidents and a YouTube search yields hundreds of videos documenting these acts of extralegal justice. My recent fieldwork in Peru, however, suggests a number of nonviolent forms of civilian security provision deserve more attention. In the context of extreme cases of brazen criminality, citizens have responded to higher victimization levels with extralegal actions to punish and deter criminals. In many parts of Peru, reports of victimization are up, public confidence in the government and police is down, and many citizens approve of taking the law into their own hands (for example, see LAPOP data). Yet, when I spoke with community leaders and residents from the Villa El Salvador district in the Southern Cone of Lima (a district with around half a million residents that experiences relatively high levels of crime), they suggested that incidents of violent vigilantism are rare. Given the conditions where one might expect to see higher levels of violent vigilantism, why have so many neighborhoods in this district on the periphery of Lima refrained from taking justice into their own hands? Citizen participation in juntas vecinales (neighborhood associations) is a key factor in limiting extralegal vigilante violence when communities confront security challenges. The program began in the late 1990s to strengthen ties between citizens and the police after strained relations during Peru’s internal armed conflict. The police needed to improve their image and build trust among a fearful population that suffered widespread torture and disappearances at the hands of state security forces in the 1980s and 1990s. Nowadays, the program provides a space for the population to coordinate with the police to confront local challenges related to crime and insecurity. Residents I spoke with in Villa El Salvador described a changing landscape of violence. Militant and state violence during the civil war gave way to violence between neighborhood youth gangs, which then transformed into drug-related violence. Many residents view the contemporary criminal violence as worse than political violence during the conflict years. Frequent murders, assaults, and armed robberies plague the district. Several residents illustrated the pervasiveness of insecurity by describing a system where thieves can rent guns to commit their crimes and return them after the deed. Perpetrators are often addicts robbing residents to support a drug habit. The Peruvian population is fed up with the rampant criminality. While some citizens have responded with incidents of violent vigilante justice, most work within institutions designed to promote citizen security through other means. For example, residents in Sector 1, Group 18 contend mostly with delinquency and robberies. The neighborhood’s Secretary General coordinated with police to organize night patrols with a dozen other residents (3 men and 10 women). The police provided participants with neon vests and whistles to identify them as members of the junta vicinal. One participant explained, “We were worried. There were 16 and 17-year-olds out in the street smoking and drinking without shame, making lots of noise. We felt unsafe, so we went to the police station and asked for help. We asked that they apply a little pressure. We then worked with authorities and neighbors to organize.” The association patrols several times a week between 10 p.m. and 1 a.m. While on patrol they prefer diplomacy to direct confrontation. Another participant explained, “We approached [the delinquents] nicely. We established a presence and we remain persistent. We make sure they understand they can’t carry on like this. They learn that we’re not going anywhere and they eventually move elsewhere.” Other actions include using a siren-based warning system, constructing gates to limit access to their neighborhood, and trimming or removing hedges in public spaces to increase visibility. 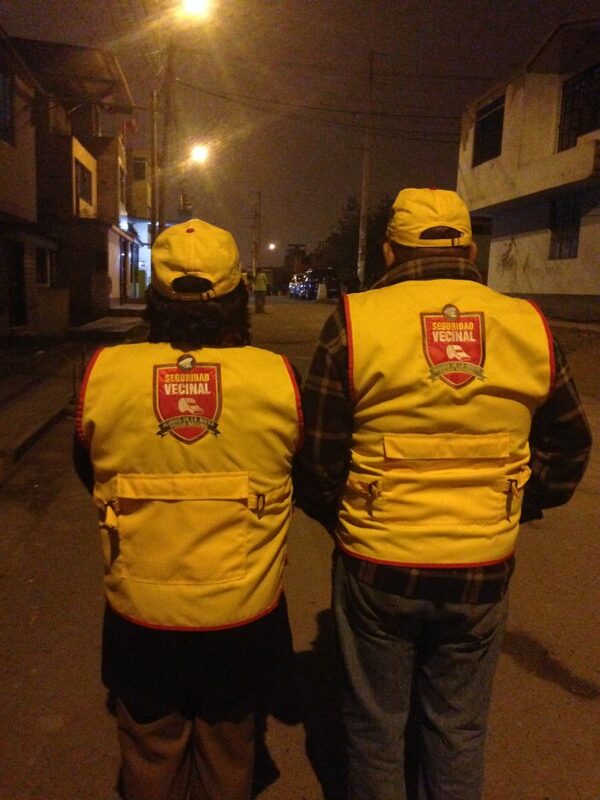 The Secretary General and another resident in Sector 1, Group 18 patrol in vests provided by police that read “Neighborhood Security: Allies of the New National Police.” Photo by Steven T. Zech. A limited number of program evaluations makes assessing claims about the effects of junta vecinal patrols on community security outcomes challenging. However, participants, residents, and police I spoke with identified a few of the ways that the patrols and other nonviolent actions directly influence criminal behavior. First, when leaders organize and participate in local patrols, they coordinate with other collective actors like women’s associations, communal kitchens, local businesses, schools, and cultural associations. Their efforts generate greater community solidarity, facilitate collective action, and demonstrate opposition and resilience to criminals and gangs. Second, the patrols can increase police capacity by providing intelligence, inviting a greater police presence, and pushing for greater accountability to limit police corruption. Participants coordinate with the police and the serenazgo (municipal patrol guards) on nights when they perform patrols. The police and the serenazgo visit neighborhoods with citizen patrols more often than those less receptive to their presence and stop by to check on citizens on nights when they patrol. Criminals and gangs prefer to operate in neighborhoods with less activity. Finally, the neighborhood associations and patrols can put pressure on local political actors at the municipality to force them to take additional steps to address community security needs. Many residents believe that local politicians at the municipality prefer to focus on projects that bring them votes and money. Historically, the municipality has insisted that community security is a police issue, which falls under the jurisdiction of the Ministry of the Interior. Increased community pressure and organizing has forced the municipality to start providing additional resources and support to address community insecurity. Neither residents nor the political authorities and police can solve citizen security problems alone. I spoke with one of the original police officers tasked with organizing the juntas vecinales and he sees the project as part of a long-term generational shift. Communities must work in coordination with the police and local authorities to focus on prevention and work more closely with the youth. 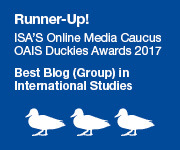 Community security became an important issue in Peru’s recent presidential election and Peru’s newly appointed Interior Minister, Carlos Basombrío, is a sociologist with a distinguished career designing, implementing, and evaluating citizen security initiatives. The police and communities are taking the initiative, but resources to expand programs remain scarce. Juntas vecinales provide an alternative to violent vigilante justice and have helped to keep extralegal violence to a minimum. Critically, association volunteers believe the police are the ones who ultimately need to intervene directly. Participants view the drugs, violence, and crime in their neighborhoods as a sickness and at this point in time they believe that the criminal code – and not vigilantism – is the most appropriate and effective cure. If Peru’s new president, Pedro Pablo Kuczynski, is going to make good on his promise to make citizen security a priority, then he might examine how the state can invest in these key citizen-led initiatives – after all, an ounce of prevention is worth a pound of cure.